Slimmer is better. 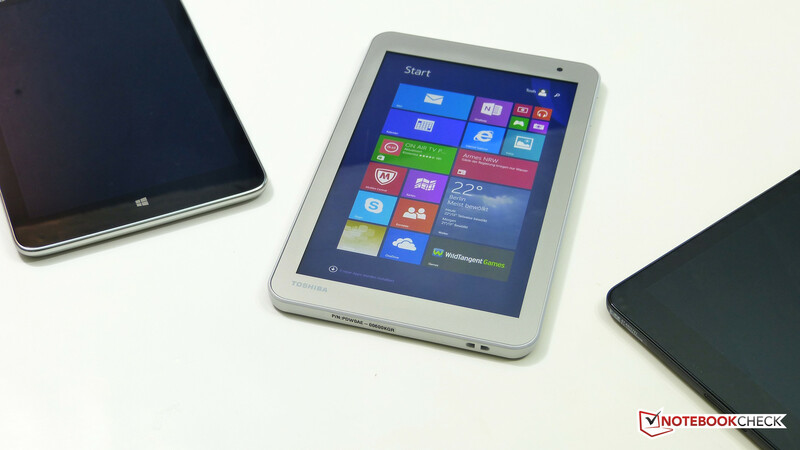 With 1GB of RAM and 16GB of storage the Toshiba Encore 2 WT8 cutting a fine line between tablet and Windows PC. It's targeted as a very low-cost solution for the consumer space and from the outside it looks good. But does it perform well enough for the price? 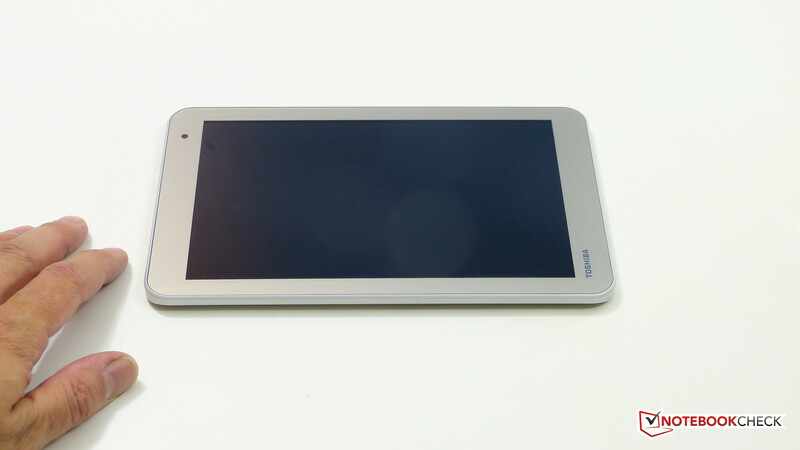 The Toshiba Encore 2 WT8-B-102 is the second 8-inch Windows tablet that Toshiba has produced and it takes the product down to a price level that's a lot cheaper than the previous WT8. It's thinner and lighter and has a very similar processor platform inside. The Intel Z3735G SoC is a refresh of the original Z3740 that has helped designers build around a smaller package with less components at a lower price but it still offers quad-core operation at a base 1.33 Ghz frequency with Turbo Boost (theoretically) up to 1.8 Ghz. The major internal change is the reduction of internal RAM from 2 GB to 1 GB which is something we're paying close attention to in this review. 32 GB of storage is included inside and there's a 1280x800 IPS screen. The Toshiba Encore 2 WT8 It's still aimed at consumer-style usage and because of a slightly more mature Windows 8.1 operating system offers some operating system improvements over the original release. The Toshiba Encore 2 is noticeably thinner than the previous model which brings it much more in line with Android-based tablets. A champagne color finish gives it a stylish look and the buttons appear to be solid and well-fitted, as does the casing. 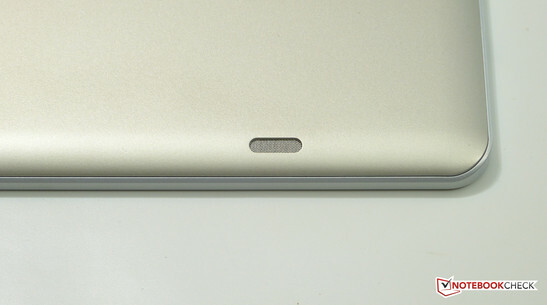 The MicroSD slot is exposed and there's no micro-HDMI port as there was on the previous model. 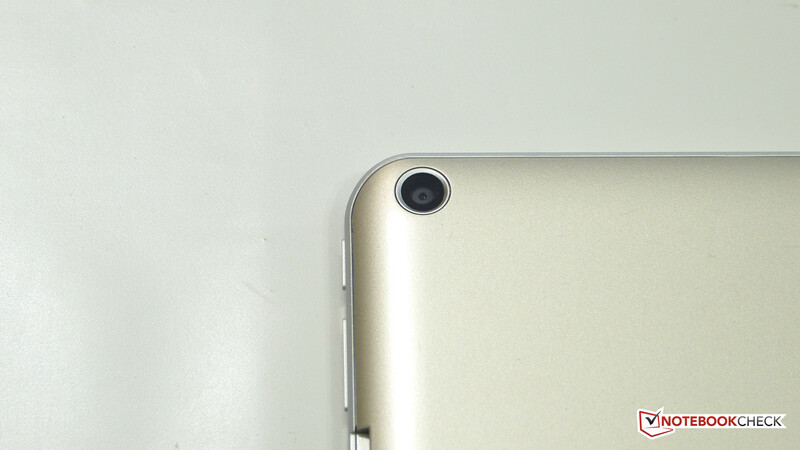 On the rear a 5MP auto-focus camera is tucked-away into the corner and 2MP camera is available on the front. In terms of weight it's again an improvement. The official weight is 390 grams but we measured slightly less than that. 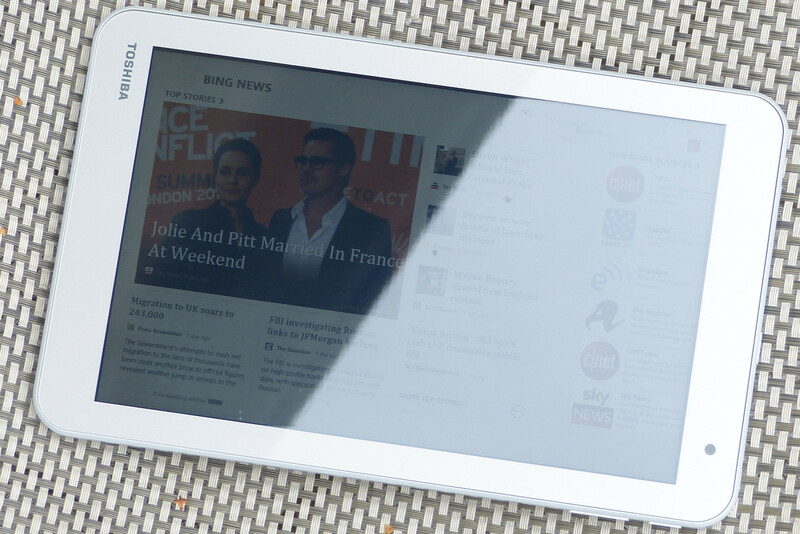 Only the Lenovo Miix 2 is slightly lighter than this in the 8-inch Windows tablet category. For comparison, an Apple iPad Air is 479 grams but it's a noticeably bigger tablet. 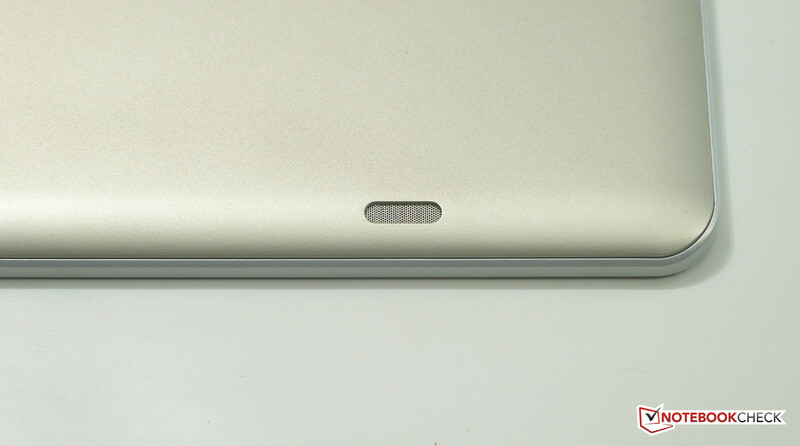 Update: After two weeks of testing we were disappointed to see a number of small scratches on the rear of the tablet. It appears that although the case is well constructed it is not scratch resistant. With just a MicroUSB charge/data port, MicroSD card slot and the headphone jack there's not much to talk about in terms of physical connectivity. The USB port is USB 2.0 and an 'OTG' adaptor cable is not supplied. There's no charging indicator lamp which is surprisingly awkward if you're used to seeing one. With no ethernet port available on the Toshiba Encore 2 WT8 Internet connectivity is left to a Realtek RTL8723BS 802.11n WiFi adaptor. B and G networks are supported but there's only 2.4Ghz support for up to 150Mbps throughput. Bluetooth 4.0 is available. A 5.0MP auto-focus rear camera is included but results aren't good enough for anything more than scanning a business card or basic record-taking. 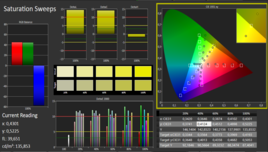 Color representation is poor, there's a lot of noise and high levels of light-bleed. 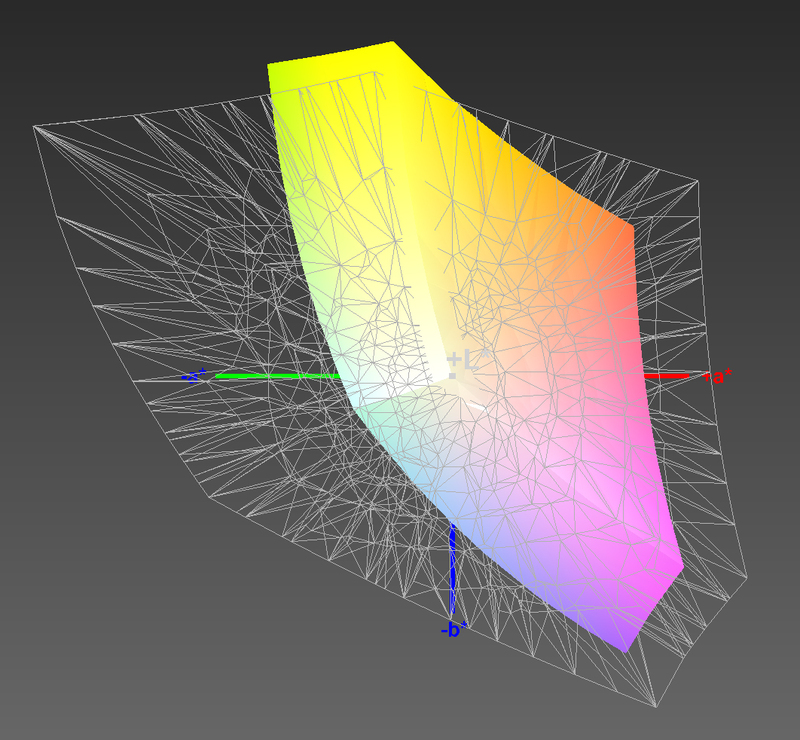 Sample images are shown. A TPM 2.0 module included and disk encryption is available if the user logs in via a Microsoft Live account. The 'Modern' environment in Windows 8 includes additional security features over apps running in the desktop. 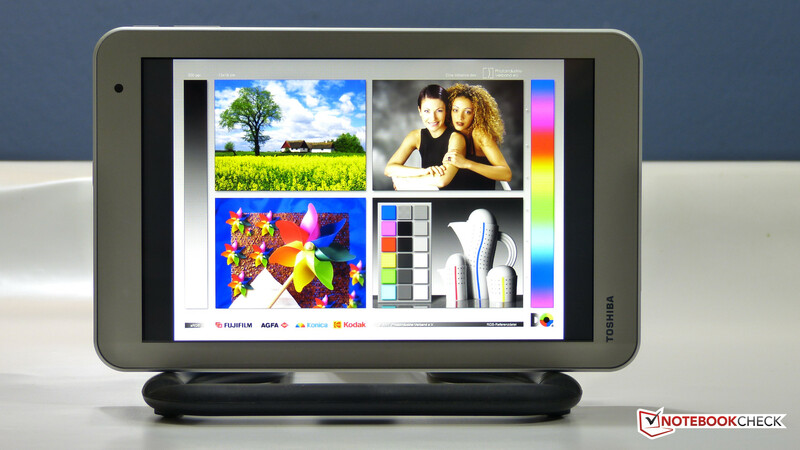 The capacitive touchscreen has 10-point touch support. Responsiveness was as expected with the Windows RT Drums application being very quick to react. There were no issues with dragging icons around on the desktop although potential customers need to be aware of the generally difficult nature of using finger touch on the desktop. A 125% size configuration is available and this helps to improve desktop touch but reduces the effective space and can cause issues with some applications. The on-screen keyboard was no better or worse than any other 8-inch Windows tablet that we've tested. The split and full modes allow users to access everything they would normally expect on a keyboard including CTRL-C, CTRL-V copy paste functions, function keys and other Windows-specific features. Auto-correct, word predition and multiple langauge and layout support is provided as standard. 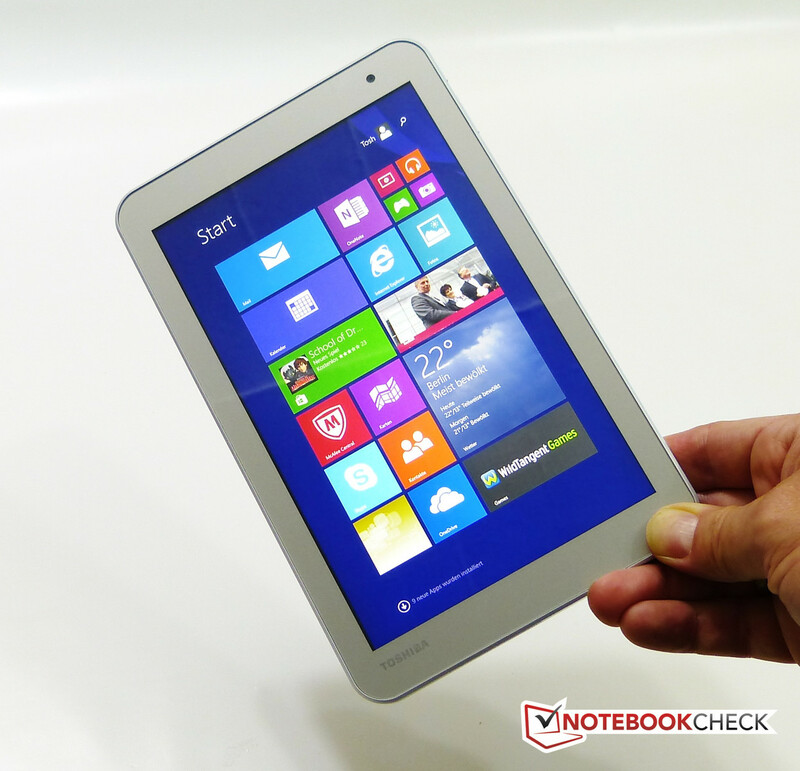 We tested the Toshiba Encore 2 WT8 with a Microsoft Wedge Bluetooth keyboard without any issues. 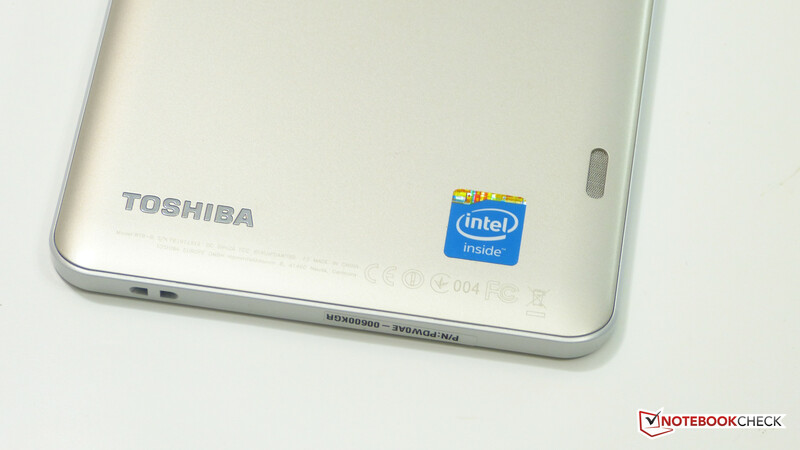 The Toshiba Encore 2 WT8 includes a glossy 1280x800 IPS display. (Aspect 16:10.) Pixel density isn't as high as with some competing tablets but we didn't have any problem with 'jaggies.' Microsoft ClearType is helping here. 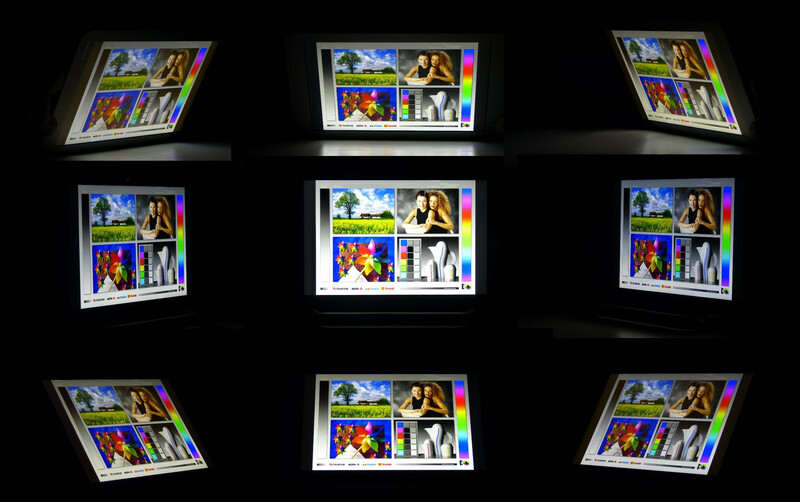 We measured an average brightness of around 280 nits which isn't class-leading and slightly lower than the max brightness on the original WT8. Contrast is improved though with our measurements showing 776:1 compared to the 670:1 of the previous WT8. The screen provides acceptable color accuracy and has a good black level and contrast for the price and target market. 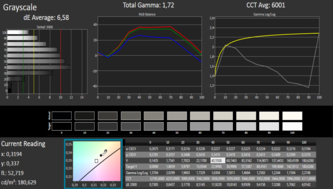 Color space coverage is fairly low at 46.68% of the Adobe RGB space which is slightly less than the screen on the previous Toshiba Encore WT8. 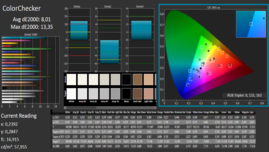 46.68% of AdobeRGB color space is covered. Toshiba Encore 2 WT8 outdoors. With a maximum of 300 nits brightness the Encore 2 WT8 isn't ideally suited for outdoor use. The glossy screen also works against the user in these conditions. The image below was taken on a bright cloudy day. Viewing angles on the Toshibe Encore 2 WT8 are as you'd expect for a modern tablet. Wide angles are covered well enough for most scenarios. Using the Baytrail-T dual-core SoC platform means there aren't many options for performance differentiators but in the Toshiba Encore 2 we have to consider the 1 GB memory, the speed of the eMMC the memory bus speeds and the overall performance of the CPU and GPU including Turbo Boost. The platform does not include the capability to create power profiles that can provide 'battery saving' or 'performance' scenarios and there's no noticable difference between battery power and mains (USB) power unless the battery level is at or below 10% at which point the CPU is throttled to 800Mhz. The Intel Gen 7 GPU is integrated into the SoC along with video decoding hardware (Intel Quick Sync support is not included on this platform as it was on the Z3740) and audio hardware. Cinebench R10 performance using the single core test shows results that match those on other Z3000-series SoCs. Multi-core performance is lower than on other devices in the same category. [See graphs below.] Despite the base clockrate being similar, Turbo Boost differences (which could be attributable to CPU configurations, Toshiba configurations and thermal profile) are producing different results. PCMark 7 is an all-round test used to measure disk, CPU, graphics and other performance charachteristics which are then presented in a single results. As you'll see below the disk speeds are (relative to spinning hard drives that were in use at the time PCMark7 was developed) very good so this is having a positive impact on the overall PCMark 7 score. Peacekeeper is a similar test but confined to the browser, It shows slightly disappointing results as storage speed is not part of the test. 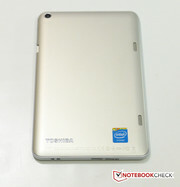 The test results here point to the CPU on the Z3735G having lower performance than some other 8-inch Windows 8 tablets. Using CrystalDiskMark we tested the performance of the main 32GB eMMC-based storage. The results are very good for a Windows 8 tablet using eMMC solid state storage and will help to offset the lower CPU performance and to improve the performance of the on-disk Pagefile. While benchmarks provides single-application and single-component performance figures there's a question that can't be answered by looking at those results. 1 GB of physical memory is a small amount for a modern PC/Windows-based product and we can confirm that it impacts performance on the Encore 2 WT8. By observing memory use and Pagefile use we were able to determine that system performance does drop when too many applications are loaded at the same time. During a session where multiple applications were loaded we saw committed memory (total memory in active use across physical and virtual memory) rise to nearly 3 GB. During that time the Pagefile was continually in use and disk activity rose as a result. Application switching becomes slow, web pages can hang and performance drops to unacceptable levels. We removed the Google Chrome background application (which appears to keep a lot of memory tied-up.) and Toshiba's Service Station application which we also saw active in the background but even after a fresh boot, committed memory rises to nearly 1GB with a proportion of that residing on disk. 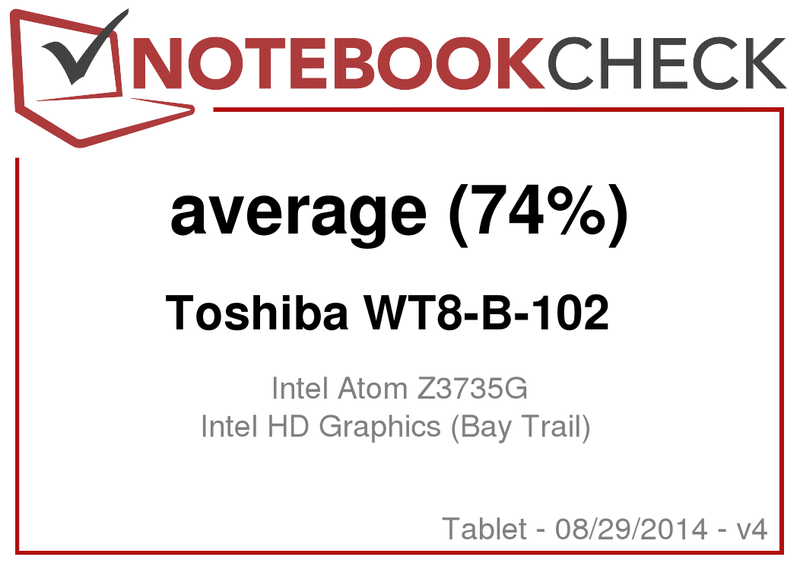 The results of our observations leads us to conclude that the Toshiba Encore 2 WT8 is not suitable for desktop multitasking, desktop gaming or heavy, multi-tab web browser usage. While the relatively fast (compared to spinning hard disk) SSD R/W speeds and access times help to improve pagefile performance there are still obvious limits. 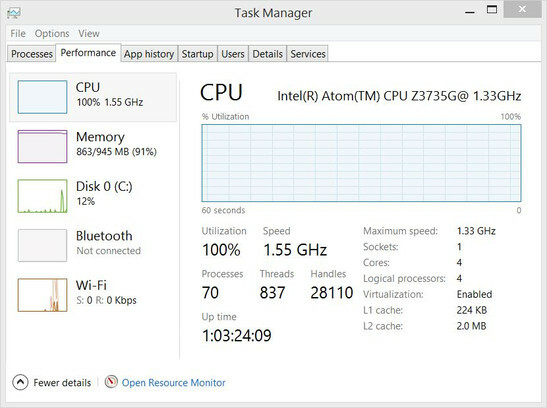 Windows RT (Modern) applications are generally less memory intensive and often run full-screen so limitations are less apparent, if at all noticable in this application environment. We ran 10 windows RT applications and saw committed memory rise to 1.6 GB - a level where most of the memory usage is still on physical RAM. Also note that the system pagefile takes up valuable disk space. On our system, after completing our testing, we saw a pagefile size of 2.7GB which is 10% of the available disk space. Notes: We did not run any third-party anti-virus solution. Windows Defender was active for all testing. There were a minimum of 59 Windows processes running at all times. Pagefile activity was monitored through Windows Resource Monitor. The Intel Gen 7 graphics solution uses a similar architecture to that seen on HD3000-series GPUs and is able to drive a low-level of desktop gaming but due to the limited RAM and disk space it's not something that the Toshiba Encore 2 WT8 is designed for. In the RT / Modern application environment things are different and we were able to enjoy all the games we downloaded. Due to the number of applications we install during our tests we experienced a number of low-disk space problems. We tested Intel Quick Sync with Cyberlink Power Director 12 (desktop application) and the performance was poor compared to some other Z3000-series platforms. This is in line with the Z3735G specifications which indicate that there's no Intel Quick Sync support on the platform. Although The Toshiba Encore 2 WT8 is capable of running Windows 8 desktop applications, gaming is not something that should be attempted. With just 300-400MB of physical RAM available after boot and tight disk space limits there's little possibility to install and run games without major issues. 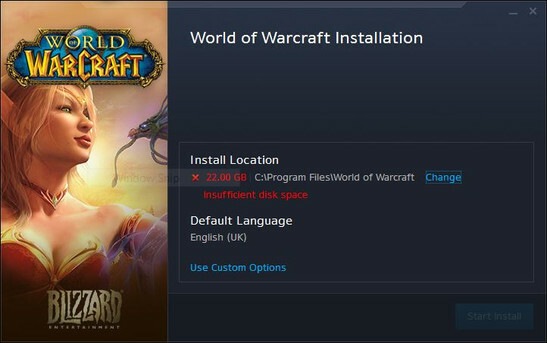 For example even World of Warcraft requires 2GB of RAM. We saw no graphical issues when using F18 Carrier Landing Lite although the vertical axis of the gyro sensor did seem very unstable. In Drift Street Mania Outlaws we had to reduce the steering sensitivity but the performance was perfect. Pinball FX2 in portrait mode was again perfect from a graphics performance and responsiveness perspective. A video demo is provided below. The 3DMark score shown was completed with errors (uknown CPU and unsupported GPU driver) and at a resolution of 1280x800 (We usually perform this test at 1280x720 resolution.) The results are lower than we've seen on other tablets in this category. 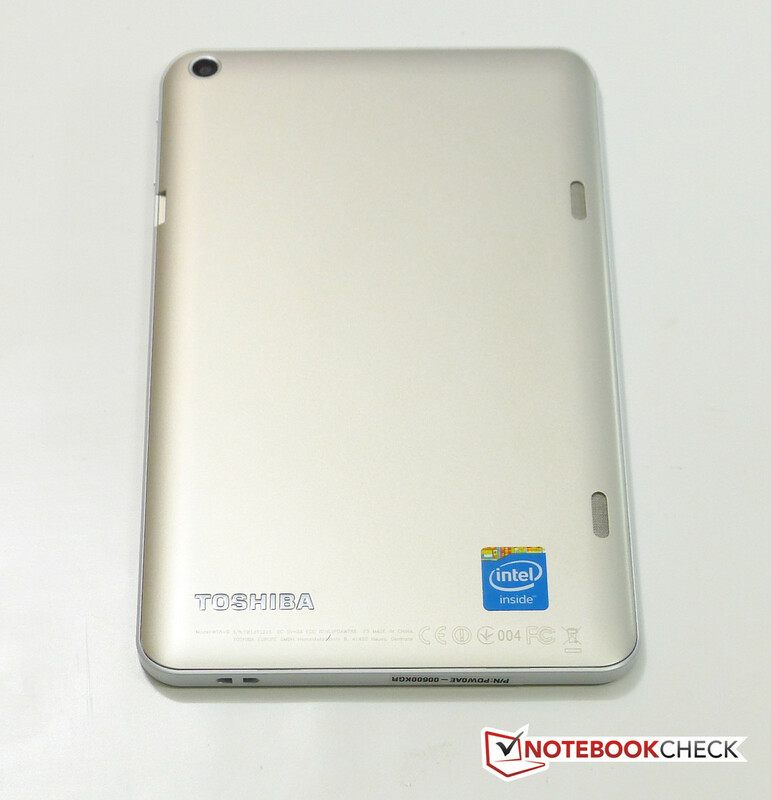 In a side-by side comparison with the Lenovo Miix 2 8 we saw much better 3DMarkk 06 scores. 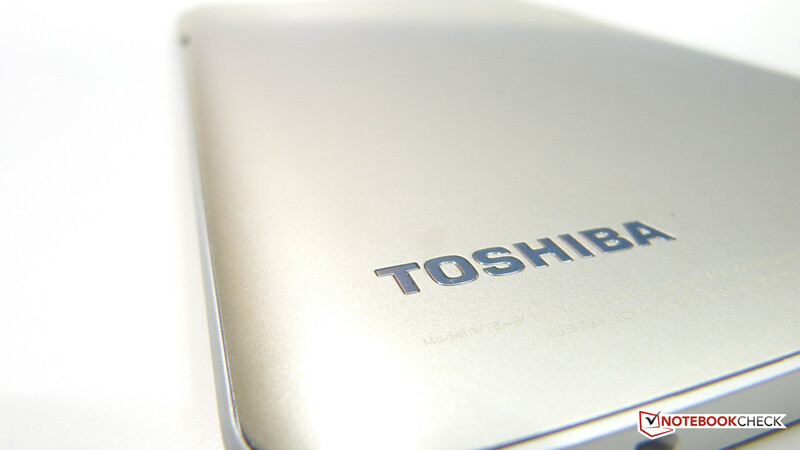 The Toshiba Encore 2 is fanless and uses flash storage is is therefore silent. The Toshibe Encore 2 WT8 stays cool under casual-usage scenarios although under load there's an area just under the rear camera that gets warm. We measured 48 degress Celsius which isn't enough to cause an worry here. Note that the Toshiba Encore 2 WT8 is fanless. (±) The maximum temperature on the upper side is 45 °C / 113 F, compared to the average of 34.8 °C / 95 F, ranging from 22.2 to 51.8 °C for the class Tablet. The rear-facing / landscape-oriented Dolby enhanced stereo speakers are certainly good enough for personal listening in the kitchen. A side-by-side comparison with the Lenovo Miix 2 10 showed the Wt8 to have a much more rounded sound with what some might even call bass being transmitted. [Tip: Lean the tablet against a solid surface to reflect as much of the audio forward to the listener as possible.] In reality that's not the case but it's a nice radio-like experience. Some distortion is experienced at very high levels. The included Dolby software allows control of equalisation, volume levelling and virtualization. External audio can be connected via the analogue headphone socket, Bluetooth (A2DP profile) and via USB adaptors. Native digital output is not available due to the lack of an HDMI port although a CD-quality digital stream can be achieved vi Miracast. DLNA is supported natively in Windows 8 and DLNA-capable amplifiers or TVs could take an uncompressed digital stream. Power is provided via microUSB and the charger is rated at 2A. 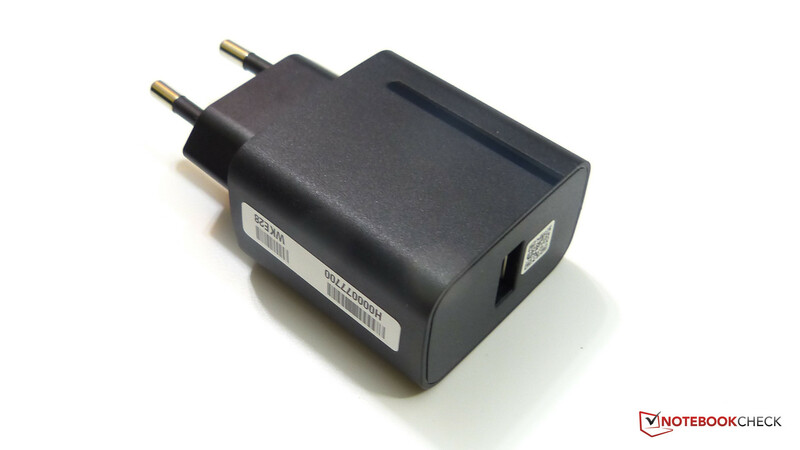 We managed to slowly charge the WT8 using a 1A adaptor but don' t recommend this. Concurrent charging and data-usage was not tested but there may be cable configurations that enable this. 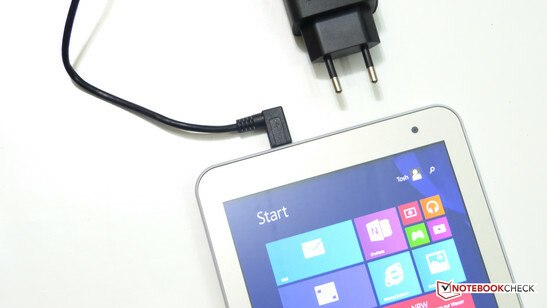 With just a 15Wh battery available the Toshiba Encore 2 WT8 has one of the smallest sized batteries of a Windows 8 tablet and indeed any Windows PC. Given that there are no major improvements to efficiency in the Z3735G over the Z3740 used in other 8-inch Windows tablets it's not surprising that battery life is not class-leading. In our tests we saw an impressive idle power usage of just 900mW and web browsing at about 2.3W. A 1020p video played in the 'Modern' video player using about 2.8W (150 nits screen brightness, WiFi off) which will bring you over 5 hours of viewing on one battery charge. In Windows 8 'powercfg' we saw reports ranging from 4.5hrs to 7hrs 40 minutes. These figures are calculated by the system at the end of a days usage. Our usage scenarios obviously range from very light to very heavy. Windows with Bing appears to be a complete build of Windows 8.1 and we didn't find any artificial limits or removed features during our testing. To change the default search engine from Bing to something else use "Manage Add-ons" from the desktop Internet Explorer settings menu. In Review: Toshibe Encore 2 WT8. Test model courtesy of Toshiba. Slower performance than the previous generation.